After missing for fifty-seven years, the Coso Artifact has been found. First discovered in 1961 in the Coso Range of eastern California, south of Owens Lake, the Coso Artifact was variously alleged to be physical evidence of ancient aliens or the product of an advanced anti-deluvian civilization or time travelers. It was even featured in a popular episode of In Search Of… hosted by Leonard Nimoy. Sliced in half, the object originally (and incorrectly) alleged to be a geode held a small porcelain cylinder inside with a central metallic shaft. During the 1990s, Pierre Stromberg was busy organizing the Pacific Northwest Skeptics group and became intrigued by the Coso Artifact when he attended multiple lectures by young-earth creationist Donald Chittick. Chittick claimed that the artifact could be evidence of a pre-flood civilization that had “internal combustion engines or even jet engines way back then.” Chittick was a defense witness who testified in pretrial depositions for the Arkansas “Balanced Treatment Act,” which required that “creation science” be taught along with evolutionary biology in that state’s public schools. 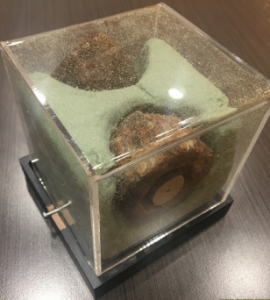 Recalling the In Search Of… episode, Stromberg decided to investigate, and by 2000 he realized, with the help of Louisiana State University geologist Paul Heinrich and the Spark Plug Collectors of America, that the Coso Artifact was in fact a 1920s Champion spark plug. Upon revealing his findings, many in the creationist community accepted his findings and ceased any mention of the artifact. But since Stromberg didn’t have physical access to the artifact, there were those who did not accept his findings, including some of the original players involved in the popularization of the artifact. As recently as 2018, some paranormal proponents, such as Erich Von Daniken, continue to promote the artifact in their literature.